We open on Prototype in a training session. He’s prevailing, but then gets to a new "level" and finds the challenge more than expected. After a bit of confusion over the state of affairs, he kicks things into high gear and overcomes his opponents…only to find himself–his suit–on fire! As things settle, we get some exposition showing us that Jimmy still having trouble with the drugs that help him to be a more streamlined Prototype…and that he’s still recovering from his battle with Prime! [Oops…apparently the Prime issue I’ll be covering in a couple weeks takes place before this one…but I don’t recall any indicator from Prototype #1 that suggested going to Prime next, instead of this issue and THEN into Prime…] The story then shifts to Stanley Leland with some backroom deal and references to some THIRD Prototype (Prototype 2000) being his true legacy, once it’s built. Next we find Bob Campbell, also making some deal, as we come to learn that he’s building a new suit for himself. In the midst of his latest parts deal, he’s approached by a strange woman, and apparently decides he can also afford an expensive ‘date’. Back at his place, rather than an intimate night, things turn violent, as the woman turns out to not be human at all, and to have retractable daggers for fingers. Campbell’s nearly done in, but his cat joins the fray (she survives…so I’m ok with this issue!). The cat buys him enough time to quickly don his home-brewed armor-suit, and prevail. Finally, we find Bob’s ex on the phone with Leland, and after she’s rejected his advances, she goes to the door…and finds an injured Bob on her doorstep. This is a mixed sort of issue for me. On the one hand, a lot really does happen throughout the issue, at least in giving us worldbuilding elements to the characters. 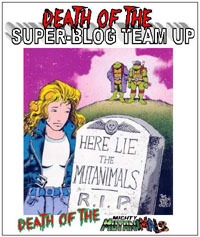 On the other hand, I felt like Jimmy was given the short end of the stick in this issue. The art’s not bad for this issue, but nothing to it blew me away. I don’t know what it was, but Bob looked a lot different than I was thinking he would in this issue…perhaps faulty memory, perhaps other elements in the time since I read Prototype #1. There was a panel where Jimmy looked a lot like Kevin Green (Prime) which seems a bit off as well–for one of them. WHICH one, I’m not actually sure. I guess that speaks to continuity and such, though. Somehow I’m just not thrilled with Jimmy’s appearance–and I feel like it somehow has something to do with seeing the Ultraforce cartoon series a few years ago, but I can’t place the exact reason…Jimmy must’ve looked different in his depiction there, or my brain managed to cross him with some other character(s). Yet another factor may simply be that this is another series I haven’t actually read in the past, so I have preconceived notions and expectations that far exceed what can be delivered. Story-wise, I feel like for "only" a second issue, for a series that I’d thought was about Jimmy Ruiz, we’ve got an awful lot of Bob Campbell. See above about preconceived notions and such. 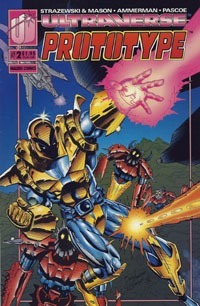 I know from some external source(s) over the years that in post-Back September stuff, it’s Bob Campbell that serves as Prototype in that universe/in that iteration of Ultraforce, so I’m sure that impacts me a bit…future-details that I can’t shake or make my subconscious ignore as I read. That said…I find Bob’s story a bit more interesting, and can’t help but feel like he could actually BE the main protagonist. Jimmy is the shiny/new Prototype and Bob’s antagonist as a replacement that he’s gotta now measure up to somehow, as he fights his way back into the good graces of Leland and Ultratech. Outside of a comment and brief ‘footnote’ referring us to Prime #4, there’s nothing to tell us ahead of time that this issue takes place after that. Perhaps that’s something that allows for the lengthier focus on Campbell here, though–Jimmy’s "second month" sees him more active in Prime than his own book? Thankfully, despite reading this out of order, I don’t think there’s anything spoilery to reading this issue first, except that obviously we know Ruiz is: 1. injured and 2. survives. I can’t complain about that for a shared universe that shares continuity and characters across titles. And I do like that this hits the ground running, so to speak. My primary problem is that we ended #1 with Prototype apparently killing someone, and then find him well after that event at the start of this issue, with little to go on outside of exposition. Maybe stuff’s elaborated on more as we go along…maybe it happens in Prime #4. We’ll see. Finding Bob’s story more interesting is rather gratifying, and leaves me even more curious about coming issues. 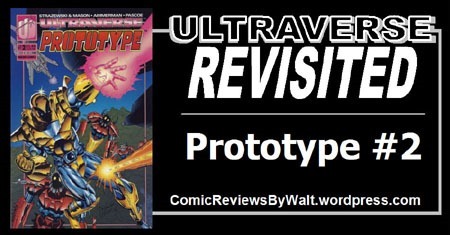 Reading all the Ultraverse books in roughly publication-order, though, there are a lotta issues between this and the next issue of Prototype, so we’ll see how my interest holds or where I’m at by the time I get to #3. As is, this is a solid enough issue, developing/continuing characters, referring to the first issue, and yet stands a bit on its own. Still, I recommend reading this along with #1, and apparently Prime #4. This is another issue that there’s no real point to seek out solely as a single issue in isolation; but nothing to say "skip" it if you have access to it.